The sweltering backwaters of Indonesian Borneo have become the unlikely ground zero for the global production and export of Kratom, a tree leaf hailed by some as a miracle cure for everything from opioid addiction to anxiety. Part of the coffee family, the leaf has been used for centuries in Southeast Asia and Papua New Guinea for its pain-relieving and mildly stimulating effects but it is now sold in powder form and exported worldwide -- alarming some health regulators who have raised concerns about safety. Kratom stimulates the same brain receptors as morphine, although it produces much milder effects. “I take Kratom and have had no problems. Every strain has its benefits – some help you relax, others can treat insomnia or treat drug addiction. Some help increase stamina,” grower Faisal Perdana told AFP. Fellow farmer Gusti Prabu, who now exports 10 tonnes of the drug a month, agreed. “Our ancestors used Kratom and there were no negative side effects. It can help eliminate drug addiction and help people detox,” he explained. But its popularity is causing concern -- the drug is unregulated, and has had little clinical testing to assess its safety or side effects. 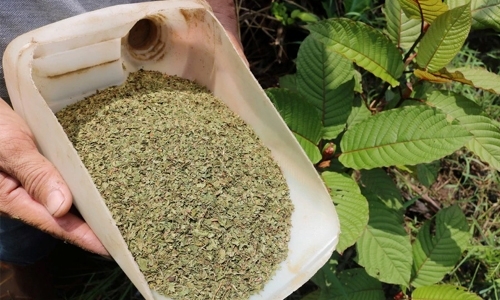 Kratom is already banned for domestic consumption in Indonesia, Malaysia and Thailand, though the former allows its export in unprocessed form. Health authorities in the United States -- now the drug’s top importer -- have linked consumption of the plant and its derivatives to dozens of deaths, warning it could aggravate a deadly opioid epidemic gripping parts of the country. Compounds found in Kratom are opioids, which expose users to the same risks of addiction and death as illicit opiates, according to the US Food and Drug Administration. But for farmers in Kapuas Hulu, West Kalimantan -- the centre of production -- demand for Kratom is such that they have moved away from traditional commodities such as rubber and palm oil to start growing the tree, turning it into a major cash crop. And at the main post office in Pontianak, the key trading post for this part of Indonesian Borneo, it’s clear the health warnings have done little to dampen interest. “Around 90 percent of our shipments from West Kalimantan province are Kratom that’s been sold to the United States,” post office head Zaenal Hamid said. As many as five million Americans use the drug and that number is growing, according to the American Kratom Association. Data from 2016 showed that the region was shipping some 400 tonnes abroad every month -- worth about $130 million annually at current global prices of some $30 a kilogramme. Most Kratom customers are reached through online platforms such as Facebook, Instagram and Chinese e-marketplace Alibaba. The trend for alternative medicine has been credited with increasing interest in Kratom from Europe and America, where it is usually consumed as a tea or in capsules. The US is struggling with an opioid epidemic, fueled by addiction to prescription painkillers as well as street drugs like heroin and synthetic versions such as fentanyl. Kratom is legal in 43 states, but the FDA is pushing for greater restrictions and has already put an import alert on it, which means shipments entering the US can be confiscated. In a statement, the organisation warned consumers not to use the drug and said it was “concerned that Kratom appears to have properties that expose users to the risks of addiction, abuse, and dependence.” Scientists say that while Kratom may have positive attributes, very little research has been done into the drug. “It has great potential as a remedy for pain and opioid addiction given its pharmacology and its potential accessibility,” Michael White, head of the department of pharmacy practice at the University of Connecticut, told AFP. “It is promising and not proven,” he added. Advocates insist it’s a safe alternative to prescription drugs and can actually help opioid addicts. “Of the 44 deaths on record involving Kratom, they all involve poly-drug use,” said Ryan Leung, a spokesman from kratom lobby group Botanical Education Alliance (BEA).